Following a process lasting almost two years, Innovative Flexotech Pvt. Ltd. has had its work processes accredited to the internationally recognized quality management system standard, ISO 9001: 2008. Innovative is one of reputed organizations in India to achieve this version of ISO 9001, which updates and replaces the 2000 version. Alpesh Thakar, Director of Innovative Flexotech commented: "We are delighted to achieve this accreditation and gaining recognition for our commitment to quality and continuous improvement. We are proud to join over 500,000 organizations across the globe that has established ISO 9001 as the preferred quality assurance standard. In working towards this award, we have analyzed and challenged every aspect of Innovative operations, involving every employee and a number of Customers .This has resulted in many improvements to both what we do and how we do it. I believe that we are now a much more efficient and agile organization as a result of the quality journey we have undertaken." Alpesh also added that it has been a great experience in terms of teamwork and they were all happy and relieved when they received the good news. The award covers their full range of Flexo Plate Making Equipments and Innovative looks forward to delight their clients even more in the future. "We are particularly pleased to have been given this accolade at our first attempt," Alpesh added. The award was made through SISBEL From European Organization.a world leader in assessing business processes and products against internationally recognized standards and Service Providing of Management system certification, CE marking, product certification in World Wide. SISBEL emphasizes that ISO 9001: 2008 focuses on processes and customer satisfaction rather than procedures and so is equally applicable to manufacturers , such as Innovative , as well as to service providers. Innovative Flexotech is a global leader in flexo printing press and photopolymer plate making technology, delivering products, services and solutions through the brand promise of "High Standard Quality, Most Competitive Price and Superior Service". Headquartered in Ahmedabad with a manufacturing plant in Viramgam, Innovative manufactures and markets CI Flexo Printing Press, Wide Web Flexo Printing Press, Central Impression Flexo Press, Stack Type Printing Press, Eight Color Flexo printing press, Six Color Flexo printing press, Four Color Flexo printing Press, Two Color Flexo Printing machine, Single Color Flexography Printing Press, Photopolymer plate making Equipments, Flexography plate making Equipments, Letter Press Plate making Equipment, Water wash flexo Plate making Equipment, Varnishing Plate maker, Pad Printing Plate making equipment, Label Plate making equipment, Flexo plate Making Equipments, Flexo plate Maker, Flexography, Polymer Stamp making equipment, Autotmatic Rubber Stamp Making machine, Liquid Resin Stamp making machine, Solvent Recovery System, Solvent Distillation Unit, etc. Innovative Flexotech has had it'swork processes accredited to the internationally recognized quality management system standard, ISO 9007 : 2008. Innovative is one of the first organizations in the India to achieve this version of ISO 9001, which updates and replaces the 2000 version. Alpesh Thakar, Director of Innovative commented:"We are delighted to achieve accreditation, gaining recognition for our commitment to quality and to continuous improvement. We are proud to join over 500,000 organizations across the globe that have established ISO 9001 as the preferred quality assurance standard." "In working towards this award, we have analyzed and challenged every aspect of Innovative operations, involving every employee and a number of Customers.This has resulted in many improvemrnts to both what we do and how we do it. I believe that we are now a much more efficient and agile organization as a result of the quality journey we have taken,"he continued. The awaed was made through SISBEL From European Organization, a world leader in assessing business processes and products against internationally recognized standards and Service Providing of Management system certification, CE marking, Product Certification world wide. 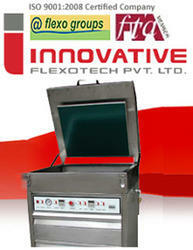 The awaed covers Innovative's full range of flexo plate making Equipments. SISBEL emphasizes that ISO 9001 : 2008 focuses on processes and customer satisfaction rather than procedures and customer satisfaction rather than procedures and so is equally applicable to manufacturers as well as to service providers. Gujarat-based Innovative Flexotech, the Indian manufacturer of photopolymer plate making machines, stamp making machines, solvent distillation unit and stack type flexo printing press participated at the Gulf Print & Pack (GPP) 2013 for the first time. Innovative Flexotech showcases flexo solutions at the GPP show. At the show, Innovative Flexotech showcased live demonstration of photopolymer plate making model A2SSF four in one model exposure, washout, dryer and treatment. Commenting on the strategic importance of the Middle East markets, Alpesh Thakar, director at Innovative Flexotech, said, “We at Innovative Flexotech, have complete range of flexo solution include more than 30 various size and application-based model in photopolymer plate processing. We are manufacturing and exporting for six years in Middle East market.